A new CSA season about to begin! Greetings from Hope’s Edge Farm! My name is Aube and I’m one of Tom’s apprentices this growing season. Throughout the summer, I’ll be uploading stories, seasonal recipes, photos and videos to keep you up to date about what’s happening on the farm. Since I am an avid food blogger (you can see my video food blog by clicking here), I was thrilled when Tom asked me to take on “blogging duties” and I look forward to sharing little morsels of our everyday life on the farm. We have been kind of hanging on to the edge of hope here (excuse the pun) with all this incessant rain! Tom sounds like he is (only slightly) on the verge of despair but he has a twinkle in his eye nonetheless, so all is not lost. And despite the mud and puddles everywhere, there are plentiful rows of proud brassicas, dainty fennel, sleek onions, shallots, and leeks, bodacious sweet corn (yes, the variety is actually called Bodacious! ), elegant kale, luscious chard, eager tomatoes, and even… tentative, tender-hearted artichokes! Of course none of these are ready to eat, but we did feast on some tasty spinach this past week (yum!) and the peas are promising to be upon us soon. We are busy transplanting, weeding, seeding, building, and sometimes singing. So all is well despite the wet weather, and we are all looking forward to providing you with a feast of fresh goodies all summer long! 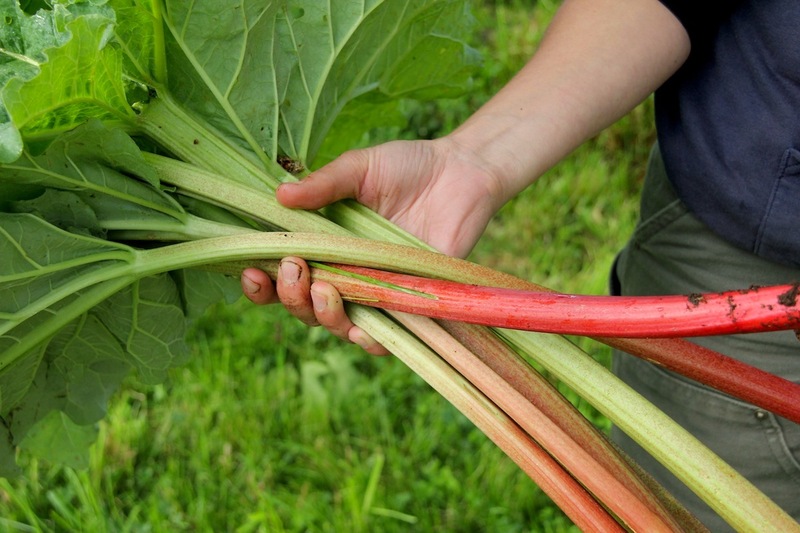 This week, I’ve got a strawberry rhubarb recipe to share with you. Nope, not pie. Sorbet! A creamy, easy to make (no need for an ice cream maker) sorbet with only 3 ingredients: strawberries, rhubarb, and sugar. 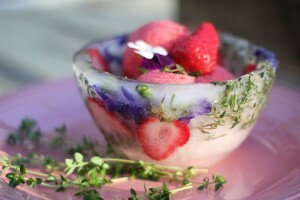 And for the presentation, homemade ice bowls lined with flowers, herbs, and berries. You can see it all in this video from my blog, and then scroll below for the recipe. Farewell for now and I look forward to meeting you soon at the CSA market days as well as our upcoming potluck on June 29! Cook the rhubarb with a little water (about 1/4 cup) until soft, around 10 minutes. Add the sugar and simmer for another 10 minutes. Allow to cool. Puree the rhubarb with the strawberries in a food processor and freeze in a shallow pan for about 4 hours. Break up the frozen mix into chunks and return it to the food processor. Puree until very smooth and velvety. Return to the freezer for an hour to two, or until serving time. 1. Pour water into the 4 medium bowls so it covers about an inch at the bottom of each. Put the bowls in the freezer until the water is frozen solid. Be sure to keep them level so that the water doesn’t freeze lopsided. 2. Remove medium bowls from the freezer, working on just one at a time so the water doesn’t melt. Place a smaller bowl on top of the ice base inside the medium bowl, making sure it’s centred. Fill the smaller bowl with a layer of heavy objects to keep it anchored down. In the gap between the small and medium bowls, drop a handful of flowers, herbs, and berries of your choice. Try to make them fill the space vertically as well as horizontally by squeezing the larger flowers, herbs, or berries into the gap so that they are held in place between the walls of the bowls and do not all float to the top. Pour water to fill this space so it reaches a 1/2 inch from the rim of the bowl. Tuck in any leaves or flowers that are sticking out of the water. Freeze. 3. Remove the ice bowls from the freezer. Run a little hot water on the outside and inside of the plastic bowls, being careful not to touch the ice, then unmould the bowls. Fill with scoops of sorbet or ice cream and serve immediately.